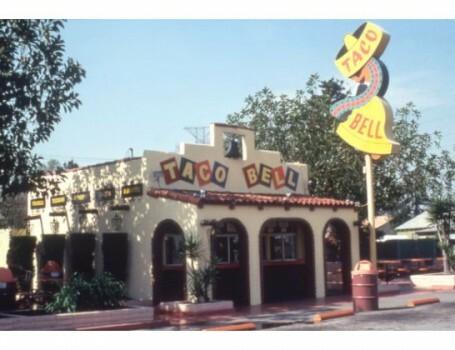 The original Taco Bell building on Firestone Blvd. in Downey, CA. The Seafood and Tacos Raul restaurant that had been located here closed in December and local preservationists believe it may be headed for demolition. UPDATE: Even though it no longer owns the building, Taco Bell corporate tells Consumerist that it’s asking Bell fans to use the hashtag #savetacobell if they want to preserve this piece of history. No idea if TB will actually do anything about it or if it’s just a PR stunt, but don’t say we never told you. The building — where Taco Bell founder Glenn Bell opened his first store in 1962 — has been without a tenant since December, and the Downey Patriot reports that local preservationists at the Downey Conservancy are concerned that the currently vacant state of the building puts it in peril. “As there is no current plan for the building’s continued use, its status is considered to be endangered,” explains the Conservancy, which has reached out to Taco Bell HQ and has also contacted firms specializing in adaptive reuse. The Downey Taco Bell as it looked in better years. The Conservancy is also suggesting that maybe it’s for the best to move the original Taco Bell to a new location within Downey, which is already home to the oldest McDonald’s restaurant in existence. That eatery, only about an 8-minute drive from the Taco Bell site, was actually the third McDonald’s ever built. Interestingly enough, there is a newer Taco Bell/Pizza Hut hybrid store that appears to be right down the street from the building where it all got started. We’ve contacted Taco Bell’s corporate office and reps for parent company Yum! Brands to see if there is any statement regarding the potential demolition of this piece of fast food history. Will update if we hear back.